We operate an appointment system, but urgent cases are always seen on the same day. Please let us know if you cannot keep your appointment so that we can offer it to someone else. We offer extended hours with the doctors on Monday from 18:30 – 19:15 and on Wednesday from 07:30 – 08:00. Have you thought about booking your appointment online? 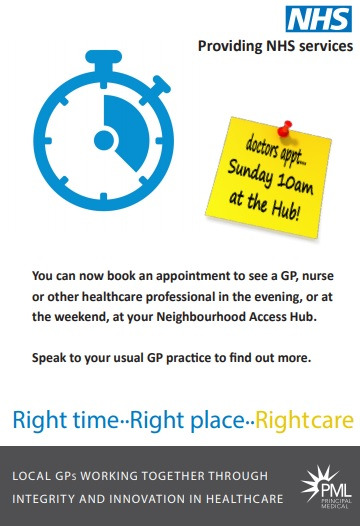 You can book at any time of day and night by using Patient Access. Visit our Patient Access page. Have you ever thought about how long an appointment is? 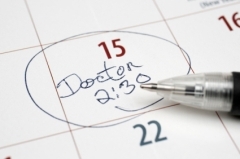 Routine appointments with the doctor are for ten minutes and for one ailment. That means that s/he has time to listen to what you have to say, take some details of how long it's been going on and what else is happening that might be causing the problem. Then you may need to be examined, a test could be needed and finally you may need a prescription. All of this needs the ten minutes allocated to you. If you have more than one problem, ask the receptionist to book a double appointment so that you can have a proper discussion and be treated for everything. If, on the other hand, you have something that is urgent and needs to be seen on the same day when there are no routine appointments free, you may be given an emergency appointment. This is a five minute appointment and can only be for something that really is urgent. If it can wait until the next day then please book a routine appointment. Children under 5 years whose parents or guardians feel that they need to be seen urgently will be seen on the same day or a doctor will speak to the parents or guardians on the phone to decide together what the best care should be. Finally, please don't bring along the rest of your family for the same appointment time as the doctor will not be able to deal with four people in the time allocated for one! Patients who come in and stay longer than their allotted time keep others waiting past their slot and that's no fun if you aren't feeling well. Our practice nurses run clinics in the morning and afternoon between 08:00 and 18:00 every day. They offer blood pressure measurement, children's immunisations, travel advice and vaccinations, ear syringing, dressings and a range of other services. There is also an early morning session on Wednesdays when the nurse will have appointments available from 07:30 – 09:00. If you need a blood test with Hannah you can phone, call in or book online using Patient Access. These appointments are available every morning from Monday to Friday. To speak to a doctor, nurse or for non-urgent advice and test results, please telephone between 11:30 and 15:00. The dispensary team offer appointments for patients interested in reviewing their medicines and their use. Please speak to the receptionist for more details. Please call reception on 01295/758372 to book an appointment with one of the team or register with us for Patient Access. These are mainly for patients too ill to attend Surgery. Please telephone with brief details of symptoms before 10:30 if possible. 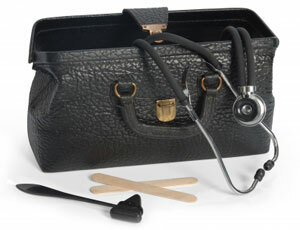 In an emergency, telephone the Surgery (01295 758372) and the receptionist will then pass your message to the doctor. Oxfordshire GPs were successful in winning a bid for money to trial various service changes across the area. The contract with NHS England is operated for our area by our new collaboration of GP Practices called NOxMed. There are some exciting plans in development but the first of these has started in the shape of the Primary Care Visiting Service (PCVS). If you ring for a home visit and the doctor thinks that you are suitable, one of the Emergency Care Practitioners from the PCVS will come to see you. The paramedic will then report back to the doctor with the results and they will work together to provide the most suitable care for you. Patients in the Banbury area will be visited throughout the day and not have to wait until the doctor is free; it will also allow the doctors to spend more time with patients who may be particularly ill or who may have very complex needs. These visits are proving very popular so let us know what you think if you are visited by one of the team. You do not require a doctor's certificate for any illness lasting seven days or less. Your employer may however require you to complete a self-certification form (SC2) which is available from your employer or on the HMRC website. If you are ill for more than seven days, your employer can ask you to give them some form of medical evidence to support payment of SSP (statutory sick pay). It is up to your employer to decide whether you are incapable of work. A medical certificate, now called a 'Statement of Fitness for Work’ (see below) from your doctor is strong evidence that you are ill and would normally be accepted, unless there is evidence to prove otherwise.